Longtime readers of this column know I’m particularly fond of games with unique themes, settings, and narrative conceits. While I’ll always enjoy giant fantasy war games or treks across outer space, there’s something refreshing about finding a great game hidden away in an unusual setup. 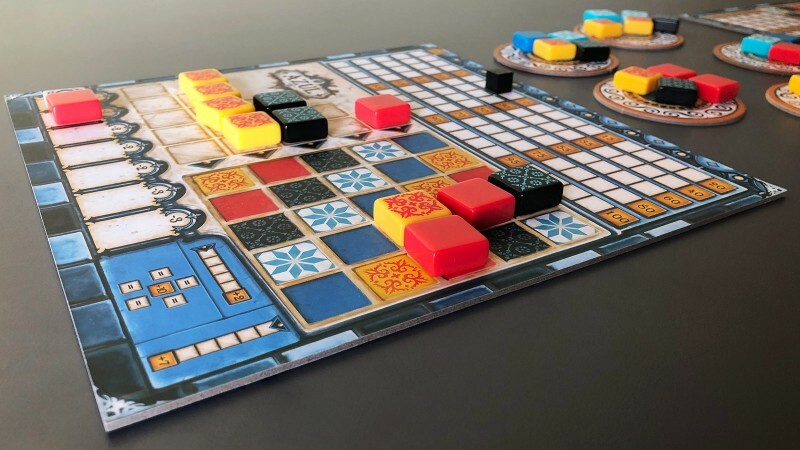 Azul casts players as tile-laying artists in the late 15th or early 16th centuries, employed by the king of Portugal to create art for the palace walls. Laying tiles on a wall certainly isn’t the stuff of legend, but the concept opens the door to some gorgeous game components and a fascinating gameplay loop of abstract strategy; once you wrap your mind around the structure of play, I promise you’ll warm to the theme in turn. 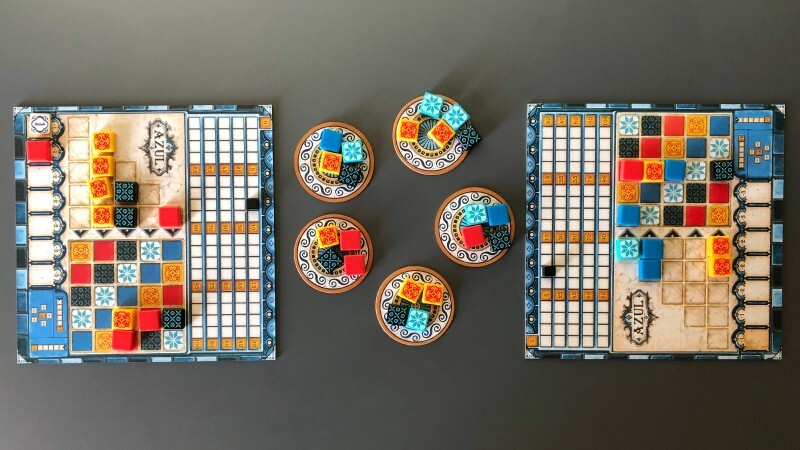 Azul melds a tile-drafting mechanic with collecting particular configurations or sets of those same tiles as you lay them out on a personal board. At its highest level, the sophistication emerges because there are so many paths to success, and on every turn, your choices are meaningful. Gameplay moves quickly, whether you’re playing with two, three, or four players, so it’s easy to enjoy several games in a row in a given sitting. Moreover, the game is simple enough to teach that players should grasp the fundamentals almost immediately; understanding the many paths to a win is much harder. To set the game up, players each get their own board that represents the wall where you’re constructing your tile art. At the center of the table, several factory displays represent the places where you might be acquiring tiles of different colors/patterns, and each of those displays has a number of randomly selected tiles (drawn from a bag) to consider. You can draft tiles from these factory displays, but you may only take tiles of one color in a given draw – the rest go to the center of the table, where they become available to your opponent artists. Your chosen same-color tiles are placed into the pattern lines of your player board. Different lines require a different number of tiles of the same color, but if you complete a line, that represents the completion of a tile on the actual wall, and you slide one of those tiles into place on your board (the rest are discarded). Play continues around the table as each player’s individual wall art takes shape. Points are scored for placing adjacent tiles, and later at the end of the game, for collecting full sets of a given color, or for full vertical or horizontal lines. The nature of that gameplay loop is far easier to understand in practice than in explanation, and I’ve found that this is a game best taught to new players by just starting a game and walking everyone through their choices as they arise. If you haven’t played, the depth of play comes from the way a single decision has so many ramifications. Do I draw those three red tiles to deny them to my opponent who is also collecting red, but with the knowledge that what I really need are those two blue tiles? What tile line should I place to support both my goal of collecting all the yellow spots and completing a vertical line? Where can I set that black tile so it maximizes its score for adjacent tiles next to it? 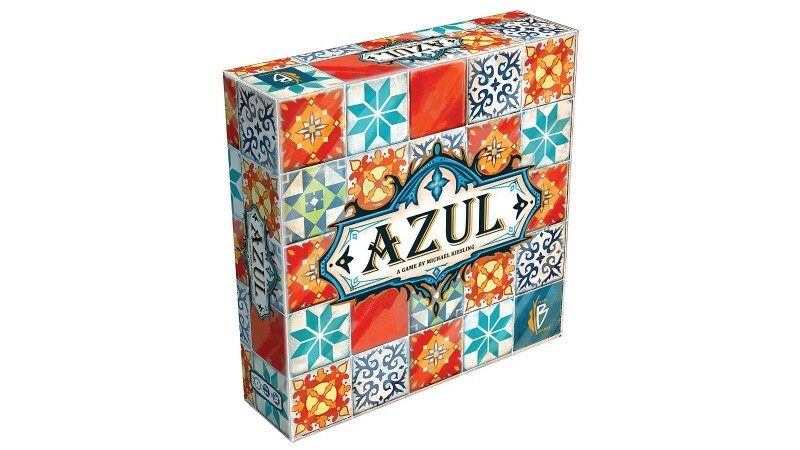 The bulk of Azul is played largely in isolation from your opponents, but the crucial tile selection phase means you must pay attention to other players and their tile drafts, maximizing your benefit while limiting their ability to score or get the tiles they need to complete a line. It’s not exactly cutthroat, but there is a draw to observing your fellow players that lends interactivity and competition to the flow of play. Watch a new group of players tackle Azul, and it’s great fun to see the many moments of realization dawn in their eyes. For a game that seems so simple at first glance, the layers reveal themselves over time, and it takes concentration and insight into probabilities to gain the advantage as the game continues. Beyond strategy, Azul is also just a beautiful game to look at. 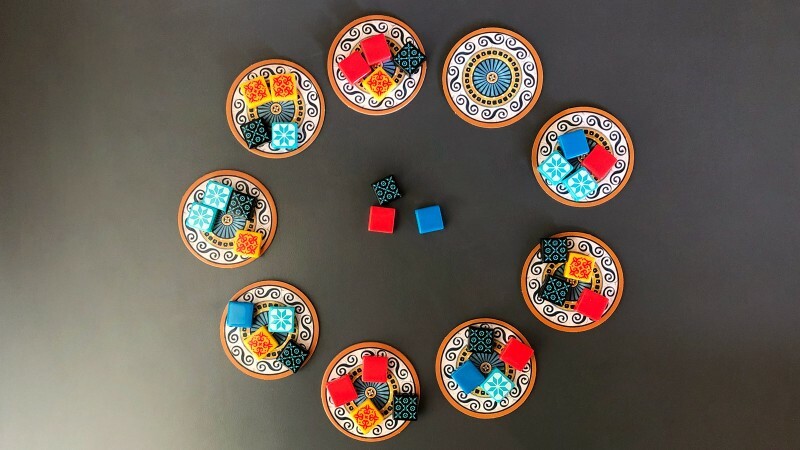 Like the azulejo artform from which the game draws its inspiration, the table layout of a game is eye-catching and colorful. The tile components are solid and make a satisfying clink as you shake the bag to randomize them. The cardboard player boards and factory displays look great – my only complaint is that the score tracker on your board has a bad tendency to get jostled if you’re not careful. I also really like that the player boards are double sided, offering a more freeform wall layout on the opposite side, and a variant style of play to explore once you grasp the standard experience. In case it’s not already clear, I adore Azul, both as a personal favorite, but also for its broad flexibility to share with different gaming groups, from veteran hobbyists to kids in the family. Publisher Plan B Games has a stellar game on their hands that is destined to become a classic in board gaming circles, and its high sales are already the envy of many other games on the market. The game was included in our Best Games of 2017, but I’ve been eager to share this more extensive recommendation, as I consider it a must-have for anyone who enjoys abstract strategy. If you’re one of the many thousands of gamers who have already discovered the fun of Azul, it’s worth noting that the game now has a second and newer game in the series, called Azul: Stained Glass of Sintra. A standalone game rather than an expansion, Stained Glass of Sintra uses similar mechanics, but offers its own twists on play, as well as translucent “glass” components to help shape beautiful colored displays. Without going into great detail, it’s fair to say that this newer installment is a bit more complicated. But it’s also different enough from the original that I have no doubt you’ll enjoy it if you’ve already embraced the original Azul. 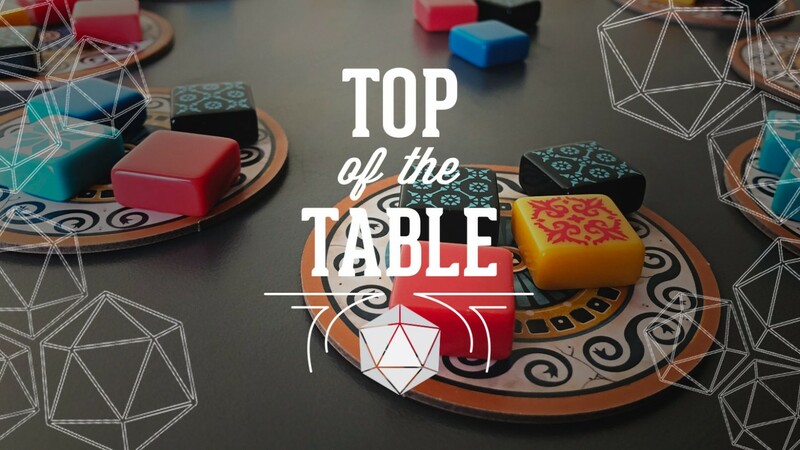 Azul has my highest recommendation, but if its abstract vibe and quiet artistic theme doesn’t do it for you, there’s plenty of other games in our Top of the Table hub for you to peruse by clicking the banner below. If you’re looking for something specific, drop me an email and I’ll be happy to help you find the right game for your friends and family.